I made these the other night and froze them. 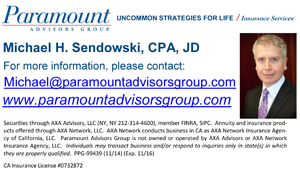 This year 2013, Shavuot falls on May 14, 15 and 16th. I am taking the opportunity to bake some dairy treats. 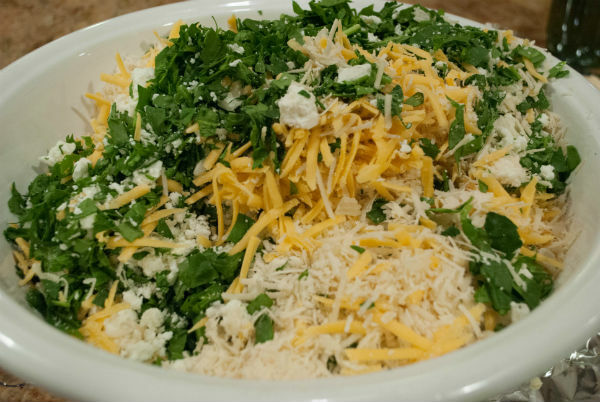 Boyus or some call them Bulemas are everyone’s favorite. Make some and your family will be grateful. The hardest part of baking a boyu is getting the dough right. 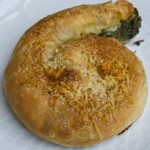 I prefer yeast dough with that special aroma and olive oil taste, crispy with just enough chew, it is the perfect pocket for salty cheesy spinach filling. The trick for getting the dough to stretch effortlessly is to make a soft dough, don’t handle it too much, and let it rest by giving a double rise and a double stretch. One more thing, I always double or triple the recipe. When you start this project make sure you are not rushed for time. I do a lot of baking at night or start late afternoon. In a two cup glass measure, combine yeast and sugar. Add warm water and stir. Add oil and set aside to proof. Place flour in a large mixing bowl, add salt and stir. After yeast and water mixture begins to foam (about 8 to 10 minutes), add yeast water to flour and mix by hand. Gather dough into a ball, working with your hands to incorporate all flour. Turn dough out onto a floured surface (marble, granite, or wood) and knead for five minutes by hand. Dough should be very soft and easy to knead. Place dough in a large clean bowl coated with oil. Loosely cover with plastic wrap and then a tea towel. and let it rise for two to two and one half hours. 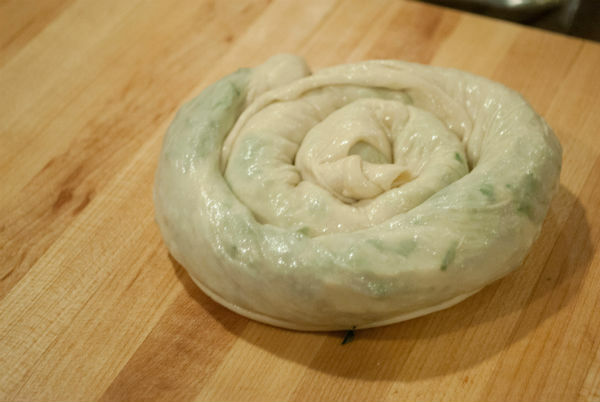 After first rise, gently press dough down and divide into quarters. Form quarters into flat balls without working dough. 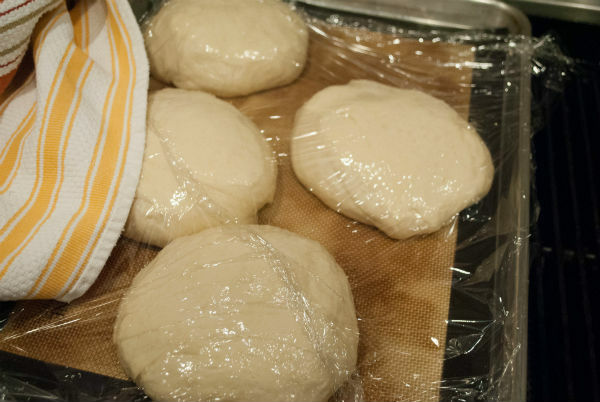 Set four balls of dough onto a silpat lined baking sheet greased with a bit of olive oil. Loosely cover dough and let it rise for one more hour. 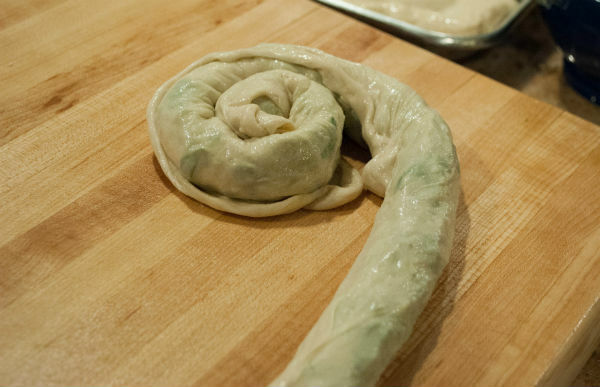 In the meantime, prepare spinach filling. 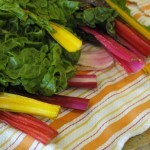 Chop spinach into thin ribbons first and then cut crosswise. 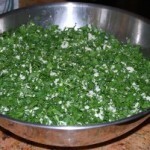 Place chopped spinach in a large bowl and combine with cheeses. 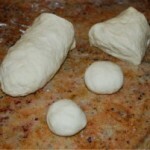 Divide each ball of dough into 4 pieces. Stretch out each piece with hands to about 5 x 7 inches. 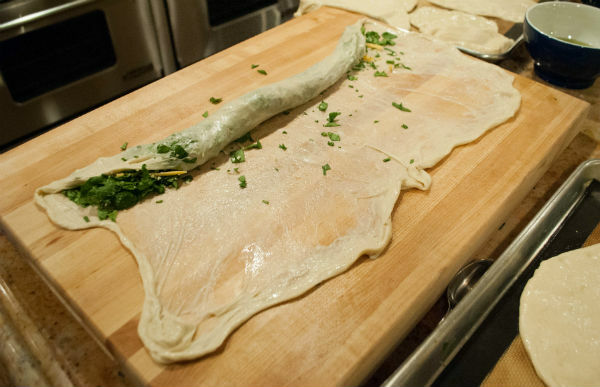 Dough should stretch easily. Set stretched pieces on work surface. Let them rest 5 to 10 minutes while you do the initial stretch to all pieces of dough. Heat oven to 400°F. For this next step, I prefer a wood board or you could use the back of a large baking sheet. Place a few drops of oil on the surface of your choice. 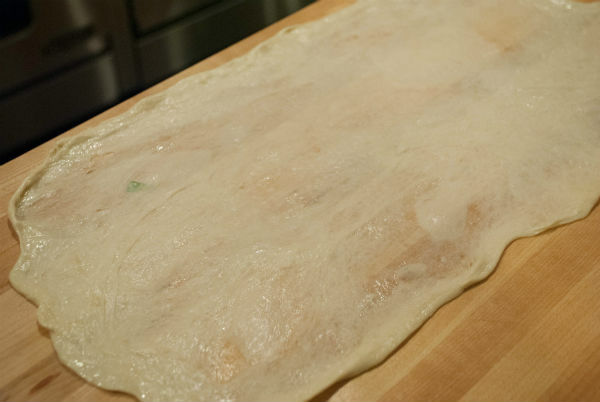 Oil your hands and stretched dough out to a large rectangle around 18 x 10 inches using the back of your hands. Dough will be very thin and transparent. Dough stretches easily. Don’t worry if you get a hole, it will get covered when you roll up the boyu. Take a handful of filling about 1/ 2 cup or more and spread it in a narrow line along the long side of dough about 2 to 3 inches from the edge. Roll up bulema into a long cylinder and coil into a circle like a cinnamon roll. Place on silpat lined baking sheet. Sprinkle with remaining Parmesano. Repeat until all spinach is used up. Bake Bulemas for about 20 minutes or until crisp and golden all the way around. Remove from oven and place on a cooling rack so bottoms stay crisp. Eat them like this, or reheated. You can freeze and reheat them in a 300°F oven for about 10 minutes. 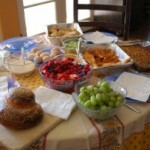 Bulemas are great for Shabbat Lunch, Shavuot, and brunches like Fathers’ Day or graduation parties. 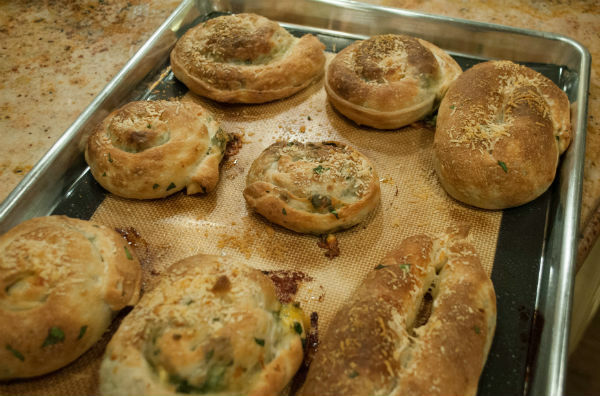 Ohhhhhhh….my favourite…my absolute all-time favourite food growing up – boyus – they are quite possibly THE most delicious, most satisfying savoury Greek/Sephardic/Ladino pastry I have ever had the pleasure to munch. And who can stop at only one! Which reminds me of my childhood ‘dilemma’ at my nuna’s house every other Sunday. 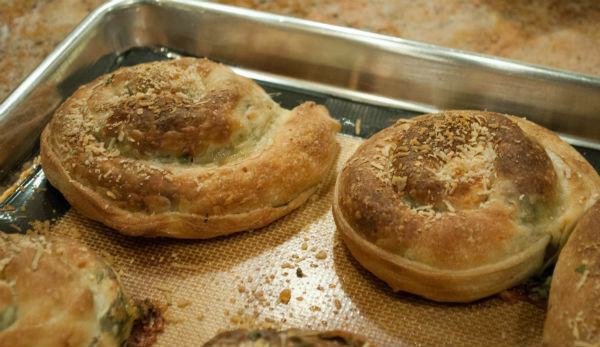 My nuna made two varities – one with spinach and cheese, and one filled with cheese(s) only. When we were kids, she’d always tell us we could have only one, as if we had any more than just the one, it’d spoil our appetite for dinner later (and she used to make the most glorious roast chicken dinners, with all the trimmings, and amazing desserts, too). For us kids, this was a big dilemma, and a big decision. Only one?! 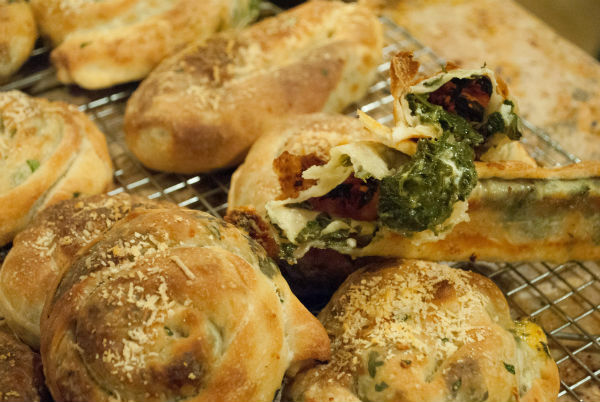 How could we decide and choose between the spinach and cheese ones or the cheese-only ones? Ahhhh…memories. I miss my nuna, and her amazing cooking (and baking). Making these in the very, very near future will bring me closer to her, in my heart and spirit. Perhaps in her honour, for Mother’s Day next weekend. Also Sephardic, here, hailing from Turkey (and then America, obvs). There are a number of different treats, but my father makes these, which we call “monte’s” or “bulemas.” We have no idea why. Frankly, I think “bulema” sounds way too much like “bulemia,” and is therefore gross. I got married about 6 months ago and it was very important to me to have these at the wedding.